TEAC CR-H258i review | What Hi-Fi? 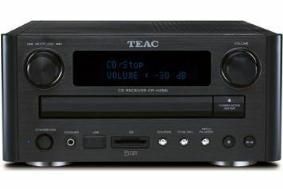 TEAC's approach with its new micro seems to be simple: offer everything its rivals do, but at a more affordable price. So the '258i contains a CD drive, USB and SD card sockets for playing back MP3 and WMA music files, twin stereo RCA inputs and one output, a subwoofer output, and a front-mounted 3.5mm headphone jack. There's no dock, but you can add TEAC's own DS-20 dock for an unofficial (read: Richer Sounds) £20, and it will even add the ability to output your iPod's video to your TV. Actually, there is one other spec-based shortcoming: the TEAC has a lower power output, at 25W per channel, than some of its 30W rivals. You might think that would imply some sort of sonic weakness. But no; the TEAC actually sounds better than its higher-priced competitors. There's no fancy slot-loader here, but place Broken Bells' eponymous debut on the CD tray, and the TEAC will treat you to an enthusiastic rendition of bouncy opener The High Road. There's just a little more precision and detail to the quirky blips and snaps than its rival and it's enough to create a more peppy and exciting presentation. True, the bass isn't quite as deep as ideal, but it's balanced and well integrated into the rest of the tonal range. Switch to Why So Serious? from The Dark Knight soundtrack and you may miss some of that depth, but you're more likely to enjoy the extra texture and nuance that the TEAC offers. This track does highlight some imperfections, though. The CR-H258i may have better timing than others, but it still gets a little confused by the louder, multi-layered section of the track. It lacks the guts really to do justice to those dramatic dynamic shifts, too. To access DAB stations you'll need to use the bundled wire-type aerial, which isn't terribly neat, but does prove able to dig up steady sound from a weak signal. Tune to Radio 1 and the TEAC's penchant for punch makes it perfect for the station's pop output, but it also has a direct and clear way with presenters' voices. This is a fine affordable micro system but it's not quite good enough to get five stars.